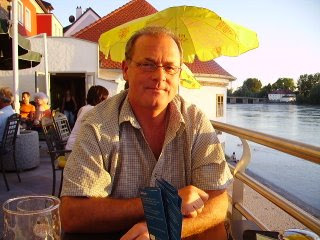 "Dr." Daniel M. Kruschinski is once again trying to "Re-Invent" himself as a business and surgeon! IHRT called this a long time ago when we posted that he would do this exact thing, and he is! What a sicko putz he is! and as usual IHRT will be diligently on top of this! **Things to take notice of in his "NEW" Endogyn site....Kru refers to himself in the 3rd person, and if that isn't psycho, what is! 1.) ENDOGYN®. remains a web site practice only, but Kru does offer OB/GYN tele-consulting! 2.) MYSURGERYPLACE®. is also a web site only practice! 4.) Notice he is down to one other Dr. practicing at "Endogyn" and the one who is no longer employed at Carpi Vitem! 5.) NO mention of any clinical studies for "Covidien" or "SprayShield." WOW, that was a quick study! Real professional Covidien! rgeries...this number changes with the wind, so it is no surprise! 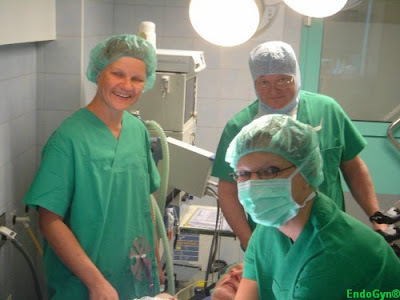 "Furthermore Dr. Kruschinski has commited himself to advice doctors in less developed countries in lift-laparoscopy and conducts courses and workshops in Africa and Asia." NEW past practices, NEW past experiences, NEW bullcrap... BUT VERY FUNNY! he established the center for minimally invasive surgery and was in charge of consulting hours for plastic surgery of the breast. he treated his patients in the Kirchheimbolanden Hospital, heading the Institute for Endoscopic Gynecology. Doctors from EndoGyn® are performing surgery in different locations and hospitals. The idea of franchsing endoscopic surgery is getting reality. 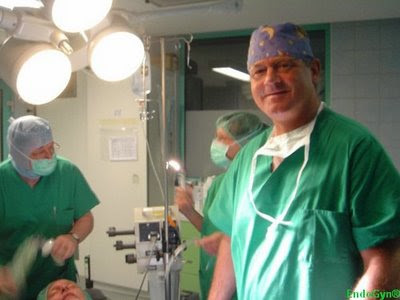 Furthermore Dr. Kruschinski has commited himself to advice doctors in less developed countries in lift-laparoscopy and conducts courses and workshops in Africa and Asia. Lift-Laparoscopy.com), was developed by Dr. Kruschinski in the form in which it is being currently used at the EndoGyn centers. 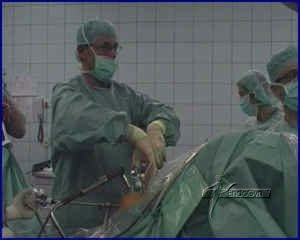 Between 1996-1998 Dr. Kruschinski developed the system VarioLiftGyn. I also introduced many innovative surgical techniques such as e.g. “Gasless laparoscopic hysterectomy with conventional instruments (GLaHCI)” or “Laparoscopic assisted mini-laparotomy (LaMiLa)”. Just when you think this could not get stranger, it does! This guy is a real piece of work, and has way to much time on his hands if he, himself, can sit around and create these bogus web sites! Which he does! These are ficticious centers, the information in these web sites are bogus! 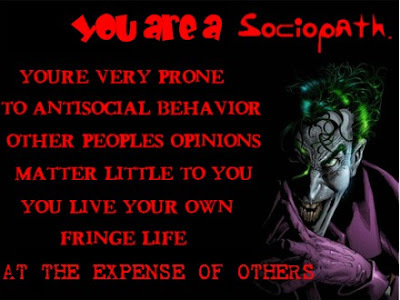 Kruschinski is once agaist perpetrating Internet fraud, a disgusting practice that he definately does have, and the ONLY practice he currently is administrating! IHRT states that ANYONE who is conned into giving this con artist even one penny or a second of interest deserves to be scammed! AND YOU WILL BE SCAMMED! which glorifies Kruschinski's gas-less adhesiolysis! any mention of all his "Adhesiolysis" success's! Dr. Daniel M. Kruschinski M.D. You will not find this report anywhere else on the Internet but in this hidden blog as it is a secret! We all know how "private" Kruschinki is when it comes to his surgeries and clinical trials! Be sure to check out the other "Categories"
found on the right hand side of this blog! Interesting! Plus check out the posts listed on the left side of this blog: Posted in Adhesions, SprayShield! AND check out "Home" and "About" another interesting trip around this blog! IHRT hopes you don't get dizzy! thought it was important enough to hide in her section in Endogyn, and though this is NOT the SprayShield™ clinical trials report, there is an exact post in "Endogyn" message board, but remember, this is NOT the clinical trial first results, it is only an older post in the message board. Helen must have missed that, but IHRT didn't! "The SprayShield™ is fully absorbed and the peritoneum is smooth and without any reaction. There are no reddish areas, like with SprayGel™ (see pictures above) and no reaction; the peritoneum is already completely healed. One can see that the areas are already free of SprayShield™ which is fully absorbed within 7 days, whereas the SprayGel™ took around 20 days for full absorption, thus representing a foreign body with tissue reactions. IHRT adds: The The new SprayShield™ by Covidien: first clinical results report is so secret that it isn't in Covidiens web site either! !!!!!!!!!!!!! <> PRESENTING <> !!!!!!!!!!!!! Since December 2008 we are using the new SprayShield™ by COVIDIEN. SprayGel™ was modified in some parts, so the resorption was promised to be shorter (5-7 days) than it was with SprayGel™(7-14 days). And the blue colour is not due to methylenblue anymore but a simple colour used frequently in food. More components were modified and I should report later in this board. For now I just wanted to show the clinical results. For clinical comparison here below you can see an image with similar adhesions after adhesiolysis and covered with the SprayGel™ and 7 days later in the 2nd look laparoscopy. Actually there seems to be a better and rapid resorption of the Hydrogel and the absence of methylenblue, which was taken from the market some times ago. I think that this result in less foreign body or allergic reactions as in some cases occurred with SprayGel™. We will continue research and if that is the case, we might decrease the time between Surgery and 2nd look laparoscopy to five days, so the time necessary to stay at the hospital will be shorter. Also some complications in regard to infections might decrease with the new product. 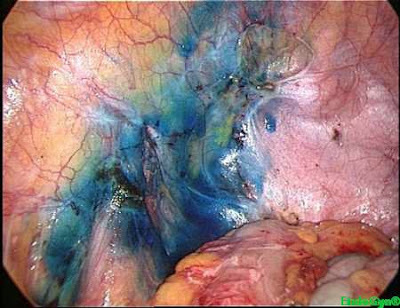 ——————–Daniel Kruschinski, MDEndoGyn.com, Adhesions.de, Hysterectomy.de, Fibroids.de, Endometriosis.de, Lift-laparoscopy.com© by EndoGyn Ltd.
Picture of adhesions on the left pelvic wall, plus after adhesiolysisafter coverage with SprayShield™: then the beautiful healed result at 2nd look laparoscopy 7 days later! and no reaction, the peritoneum is already completely healed. Again pictures of adhesions on the right pelvic wall. After an appendectomy the bowel (mid picture) is completely adherent to the pelvic wall and has to be dissected: next picture after adhesiolysis, next picture will be after coverage with SprayShield™: then last picture you see the beautiful healed result at 2nd look laparoscopy only 5 days later! Also here to see: the SprayShield™ is fully absorbed and the peritoneum is smooth and without any reaction. There are no reddish areas, like with SprayGel™ (see pictures) and no reaction; the peritoneum is already completely healed. Daniel Kruschinski, MDEndoGyn.com, Adhesions.de, Hysterectomy.de, Fibroids.de, Endometriosis.de, Lift-laparoscopy.com© by EndoGyn Ltd.
<><> IHRT recalls that Kru also say that he would not do TLL as his results were so good they were "Miracles?" <><> IHRT asks if the Spraygel was so bad, why didn't Kru misrepresent it to his patients? <><> If patients are NOT well after surgery at Endogyn - is it from bad Spraygel? Hi All, SprayGel is used in our Institute now for more than 2 years in combination with gasless laparoscopy with very good results. We perform adhesiolysis also in very severe cases of bowel adhesions and sometimes in combination with bowel resection. SprayGel, the same as surgery itself, is inducing a slight inflammation as an answer to injury (please see Shirlis comments in new publications from the lab) which is exactly the effect that we want to have as this induces a neoangiogenesis and forming of a new peritoneal surface to the injuried / wounded area. If any infection occurs, regardless from what the reason might be (bowel lesion, infection in the abdominal cavity) in the past we realized in the second-look at day 7th after the initial procedure, sometimes a much stronger inflammation than usual. To avoid such an inflammation we changed our surgical concept: in cases with bowel involvement and the risk of infection, we don't apply SprayGel at the initial procedure, instead of this we perform a second-look after 3 days to check, if there is any infection and to wash the abdominal cavity. At this procedure we than apply SprayGel and avoid by this, the "over-reaction" of the body to SprayGel in cases with infection. Remember: this change is made in order to increase our success results, even in complicated cases, which will need 2 or more surgeries. The goal is to perform an adhesiolysis procedure that works, even if we need more surgeries. Laparoscopy with gasless is less invasive to the body, so we can apply such a concept to our patients and this increases our success rate. Regards -------Daniel Kruschinski, MD EndoGyn.com, Adhesions.de, Hysterectomy.de, Fibroids.de, Endometriosis.de, Lift-laparoscopy.com © by EndoGyn Ltd.
after all, no surgeon could get so confused about a product of such importance to his outcomes, now could they? And, would a surgeon of Kruschinski's calibor put his own patients in harms way by presenting his clinical data depending which way the wind blows? Take a look at these videos and make up your own minds about Kruschinski's proficancy as a surgeon, a researcher, a pioneer in the world of surgery, a man of morals, compassion and honesty, after all, many did trust in him enough to have more then one adhesiolysis with him, and many who are not well today might still believe every claim he makes is truth! IHRT: State of the art technology, but Kru doesn't show himself performing this adhesiolysis? Could that little "glitch" in the beginning of it be part of a "cut and paste" operation in making this video? Here are some impressions from the OR at the Klinik am Zuckerberg and some faces for you to get familiar with. Most of them you will see only at the operating or recovery room. Myself starting the preparations for the surgery. Mr. Jochen Vogel manager of Klinik am Zuckerberg, +1149 531 2633 234 ask him personally <> or write an email to him at j.vogel@venenzentrum-bs.de. Covidien has more than 42,000 employees worldwide in 57 countries, and its products are sold in over130 countries. 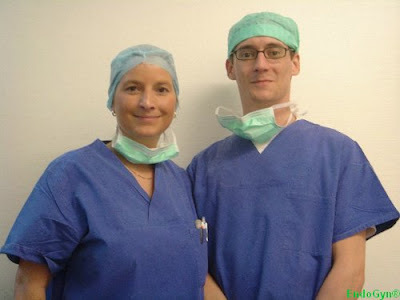 IHRT bets that Covidien is very gratefull for Dr. Daniel Kruschinski and his "Endogyn" staff at Zuckerburg Klinik for there achievments in this sttudy and it's submission to the public via a Blog! Very proffesional indeed, Mr. Flora. Wondering why Doc. Kru is not posting in Endogyn anymore?? IHRT has that answer...more to come! "I taught him everything I knew!" I just wish we wouldn't have gotten caught before we were to big to be stopped!" Caught? What? Who got caught! Not me! Do I look bankrupt? I am doing clinical studies, surgeries everyday at Zuckerburg, flying off to Thialand and Africa, have a wife, 2 mistress's, 4 kids that I claim and do not pay support to, enough food, beer and booze to keep me happy, and I don't pay taxes either because all of the above is all paid for by the German government to boot! In fact, I never paid taxes now that I think of it! 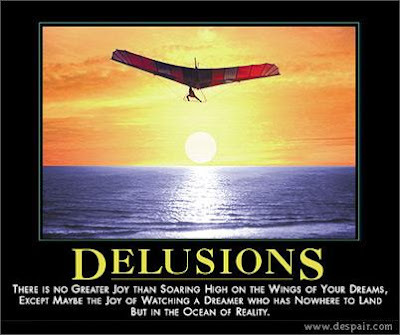 Below you will find the most delusional person in the world!!!! MORE FACTS about SPRAYGEL to come......and why Kru is not posting in Endogyn anymore! HINT....email Jochen and ask!